Nichole and Howard exchanged vows on 12-8-2018 at Alla Famiglia Restaurant, in an intimate wedding ceremony for just their close friends and family. Nichole carried a beautiful crystal bouquet down the aisle, which we lined with with glass enclosed candles. White poinsettias accented the sparkling pine arch, which was the backdrop for the ceremony. The bride, groom, and their wedding guests dined at a family style table at Alla Famiglia Restaurant. Their centerpieces were full with vendella roses, lisianthsus, gold hypericum berries and various winter greens in our silver mercury glass bowls. This weekend, on 12-15-2018, the festivities continued at Monterey Bay Restaurant. The newlyweds had a reception for many more of their friends and family in the lower level of the restaurant, which was decorated with festive red flowers & decor, in the spirit of the holiday season! The low centerpieces, prepared in gold cubes, contained red roses, red carnations, frosty pine cones, with golden curly willow accents. Petite bubble bowls with roses and gold ornaments adorned the cocktail tables. The high centerpieces had red roses, red carnations, golden ornaments, frosty pine cones, winter greens, golden curly willow, and other gold accents. It was truly a pleasure working with Nicole & Howard to make their vision a reality! We hope that they continue making special memories like these for many years to come, and are thankful that we could help them on these most special days. Congratulations Again! PS…..and we understand that Santa came!! He Did! He Did! This entry was posted on December 16, 2018, in Ceremony Sites, Exploring Colors, Ideas & Arrangements, Other venues, Weddings - 2018 and tagged Alla Famiglia Restaurant Monterey Bay Restaurant, Christmas Wedding, red flowers. You might have thought that the parade on Saturday in Washington, PA was being held to honor our wedding couple. You would be wrong – it honored our veterans – but it marched right on by the wedding site! November 10th was a star-studded day for Lia & Devin in many ways. Their black and white wedding colors looked awesome in the stately George Washington Hotel Ballroom. Black candle screens and lanterns furnished by Parkway Florist were the perfect compliment to the ballroom’s colors! Lia carried a bouquet (Bouquet #914) of all deep red roses, while her bridesmaids carried bouquets of all white roses (Bouquet #915). Rose petals adorned the cake table as well as the stylish crystal candelabras furnished by the George Washington Hotel. Thank you, Lia & Devin, for allowing Parkway Florist to be a part of your special day. We hope all your dreams came true! This entry was posted on November 14, 2018, in Ceremony Sites, Other venues, Weddings - 2018 and tagged Black and White Wedding, bridal bouquet, bridesmaid bouquet, Roses. Brass Arch – Our Brass Arch is a flat arch, primarily used inside, because it needs a level surface to stand on. We frequently will decorate it with flowers, as shown below, which are then removed when pictures are completed. The flowers are then re-purposed into a reception venue on a head table, cookie table or similar area. Sometimes the arch is decorated with tulle and lights, which is perfect for a winter wedding! The entire arch is often moved over to the reception area, and used behind the head table, or as a backdrop for photos during the reception. Black Arch — Our Black Rod Iron arch is very sturdy, and can be used inside and outside. A flower piece is made for the top of the arch, which is removed after pictures, and transferred to the reception area. We also have free-standing Shepherd’s hooks and lanterns, which can be used on an isle with flowers, mason jars with flowers, etc. Hexagon Arch – The Hex Arch is our newest creation, and one that is pretty outstanding! This was the result of a picture presented to us by a Bride, who asked if we could do this. We said Yes, and proceeded to make it happen. The hardest part was making the pieces fit together in such a way that it could be transported in our trucks. Candle Screens – We own folding wrought iron candle screens, that can be rented for wedding ceremonies. Each candle screen contains approximately 50 battery operated votive candles enclosed in glass cups. When these are all turned on, the flickering glow of the candlelight is awesome!! We most frequently use all four screens, for the most impressive impact. All of this equipment is owned by Parkway Florist, and is available to you, our customer, if we are providing flowers for your event. Equipment is available on a first come – first served basis. We also have a supply of columns, glass vases and risers that are not pictured here. Please contact us if you have questions. This entry was posted on November 7, 2018, in Ceremony Sites, Ideas & Arrangements, Other venues, Tid Bits, Weddings - 2018 and tagged lanterns, pew decorations, wedding arch, wedding candles. As our 2018 wedding season rolls right along like a high-speed train, we have been part of many different types of ceremonies, and we would share some of the offerings we have for wedding ceremonies. Our very versatile pipe and drape was featured in several ceremonies this year. From intimate to grand, we are able to convey several different styles. Accented with flowers, candles, lanterns, or flowing fabric panels, the pipe and drape has lots to offer. Below are a few of our favorite ceremony displays. The Chuppah is a traditional ceremony structure for Jewish weddings., or it can be the Mundap for an Islamic ceremony. This equipment can also be used in non religious ceremonies. Accented with flower cuffs and a heavily petal sprinkled isle, this setup is quite the show stopper. (The stripped fabric shown on the front of this Chuppah is a family tallis — or prayer shawl). This Chuppah is illuminated with battery operated lighting, which we also supplied. 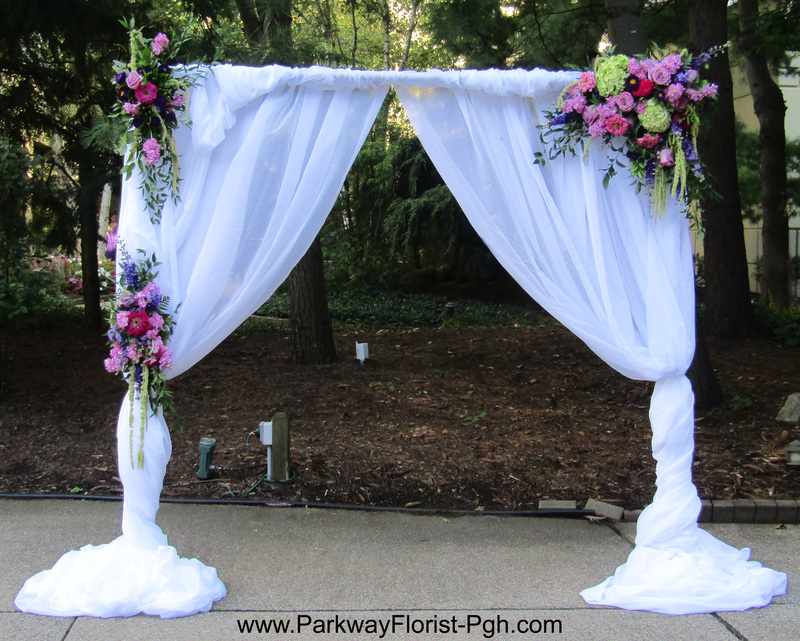 (The size of this Chuppah is 8 feet across, and can be adjusted in height to approximately 15 feet tall. Twelve feet tall is generally the ideal height in a high ceiling ballroom). 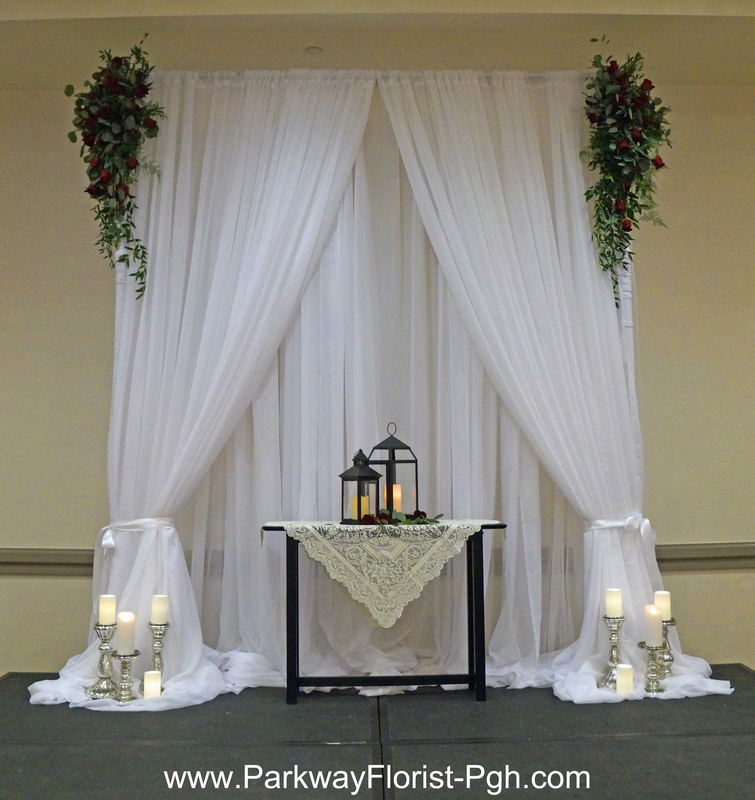 This square chuppah adds a very structured look to our pipe and drape. Clean lines, and crisp white hydrangea across the front bring a modern and contemporary feel to the ceremony setting. 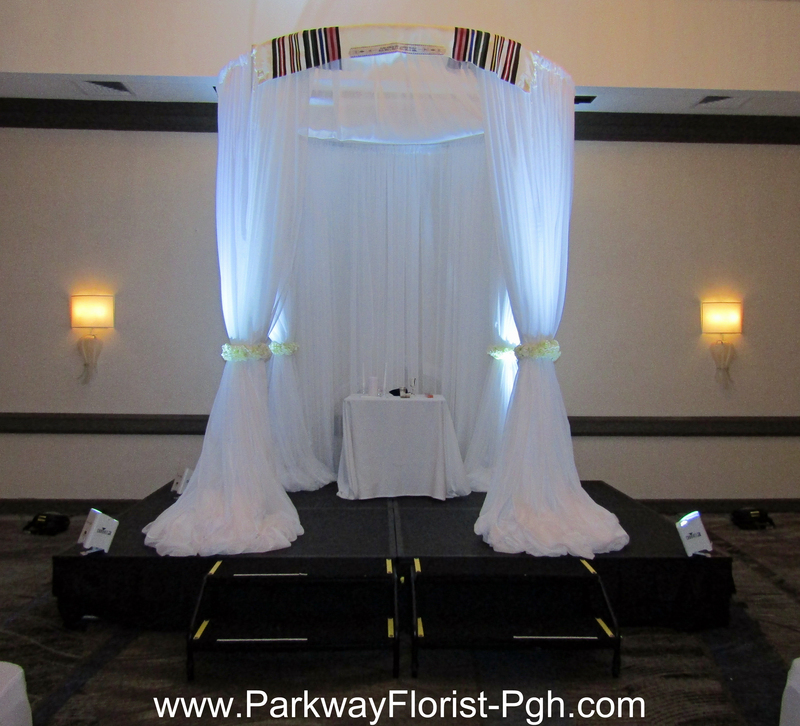 This square chuppah can also be uplit from the floor, if you desire. 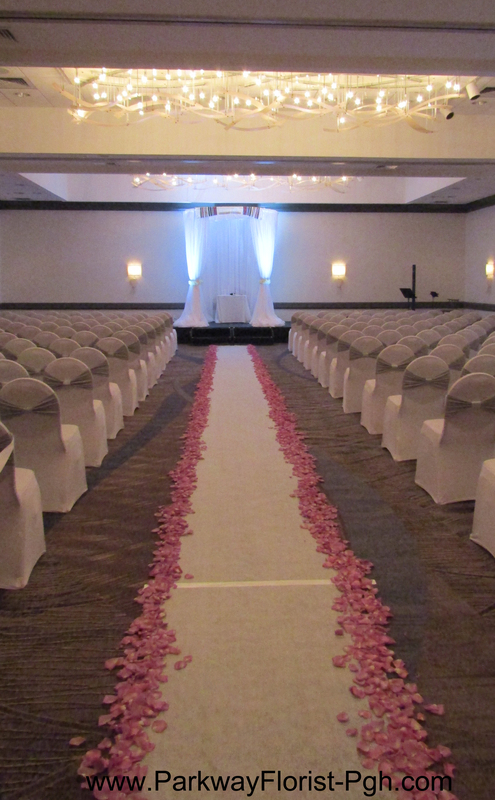 For an intimate look, consider this our half circle pipe & drape. This curved design helps to create organic lines for a cozy and intimate ceremony setting. While we are showing only 1 flower piece on the pipe & drape, garland could also be used, or more than one flower piece could be used. We always strive to have the flowers re-used somewhere in the reception following all picture taking, in whatever setting we help our brides with. Romantic and luxurious, swagged fabric and candles create a classic look. Our fresh Floral badges add a splash of color. The possibilities are endless! (The flowers are dismantled quickly from the Ceremony setting after pictures, and transferred to the reception area for use on head tables, cookie tables, or where ever bride & groom want us to use them. Whether enhancing a ballroom ceremony, or decorating a courtyard garden, our pipe and drape offers a plethora of stylish options for your “I Do.” In a future post, we will feature some of our other available equipment. As a matter of information, our pipe & drape — in any fashion — are rented to you for your ceremony, only if we are providing all the personal flowers and reception flowers for your wedding day. We do not rent pipe and drape out separately. Please call with any questions. This entry was posted on November 1, 2018, in Ceremony Sites, Ideas & Arrangements, Weddings - 2018 and tagged 2018 Wedding Flowers, 2018 Wedding Flowers Trends, 2018 Wedding Season, 2018 Wedding Trends, 2018 Wedding Venues, 2018 Weddings, arches, archways, ceremonial archways, love, pittsburgh, Pittsburgh PA, Pittsburgh Wedding, pittsburgh weddings, Special Locations, Unique Wedding Centerpieces, Unique Weddings, wedding, wedding arch, Wedding Centerpieces, wedding chuppah, wedding design, wedding flowers, wedding planning. As we wrap up the month of October, we’re loving the warm oranges, reds, and burgundies that brides are choosing for their wedding flowers! Kelly & Greg’s wedding took place at St. Mary’s of the Mount Church. Kelly carried a bouquet of Mango mini callas, deep red, dark orange and yellow roses, red hypericum berries, and blue thistle (#910). Her bridesmaids carried bouquets of deep red and dark orange roses, red hypericum berries, yellow wax flower, and novelty mums (#911). Their reception took place at the Sheraton at Station Square. There were two types of centerpieces, one with dark orange roses, burgundy mums, red hypericum berries, and accent autumn leaves (#586) and the other had red roses submerged in water in cylinder vases! Congratulations to the newlyweds! We’re happy to have been a part of your special day. This entry was posted on October 30, 2018, in Exploring Colors, Ideas & Arrangements, Weddings - 2018. Elizabeth and Brandon’s wedding on 10-13-18 had all the right elements to create the feeling that you were walking into a secret garden. The place card table greeted guests as they headed toward the reception. Dreamy, flowing chiffon panels provided a dramatic entrance as guests passed into the Secret Garden. A glittery sweetheart table for two was framed by 2 ivory and white arrangements on columns. The understated Bethel Bakery cake was dressed with soft pink and white spray roses. Guest tables were adorned with lush full centerpieces following the ivory, blush and maroon color scheme. This dreamy wedding was memorable in so many ways! We thank you, Lizzy and Brandon, for allowing Parkway Florist to be a part of your special day! Congratulations again! This entry was posted on October 19, 2018, in Weddings - 2018.